We are all too aware of the threats ecosystem engineers, such as corals, face in light of global climate change. However, a new study by Rinkevich et al. (2016) suggest chimerism may be a a weapon to combat climate change. The coral Pocillopora damicornis can release either sexual or asexual planula-larvae. Rinkevich et al. (2016) documented the release of asexual propagules from mosiacked maternal colonies that are chimeras. In a single clutch, … each of the chimeric larvae presented different combinations of maternal genotypic constituents, altogether creating a unique genetic variability by means of asexual reproduction. This genetic variability may confer ecological advantages to this type of reproduction. These novel genetic entities have a greater store of variability and may have a much wider range of physiological responses. 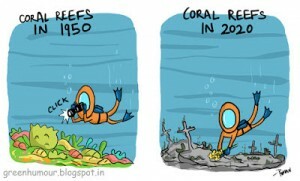 Could this be a partial reprieve for some brooding corals? Rinkevich et al. (2016) Venturing in coral larval chimerism: a compact functional domain with fostered genotypic diversity. Scientific Reports 6, 19493.